I picked up an ADXL335 accelerometer in a packaging designed to fit onto a solder-less breadboard so that I could interface it to my Arduino. I had a few time-consuming problems interfacing with it because I’m not used to reading chip data sheets. My assumption was that you’d deliver voltage to it, and it would spit out an analog signal that could be easy translated to acceleration using some constant factor. This isn’t exactly the case. The output resolution, milliVolts per g (1 g = Earth gravity), and voltage bias, is dependent on the voltage delivered to the power pin. I think in hindsight this makes sense, but the data sheet phrases this, and a few other things very peculiarly. I’m fairly inexperienced reading chip data sheets. The data sheet is here (PDF). On the third page is pretty much everything you need to know to get useful data out of it, and the rest of the doc is stuff most hobbyist level people don’t care about, like how it behaves in different temperatures, and noise expectancy. The phrase “RATIOMETRIC” shows up a few times. What this means is that a few of the specs are dependent on the power delivered to the chip. The sensitivity (mV/g) is stated to be ratiometric, and the example they give is that when you deliver 3V to the power supply, the sensitivity is 300 mV/g. In a later section called “Use with operating voltages other than 3V” it gives the example of 360 mV/g with a 3.6V power supply, and 195 mV/g with a 2V power supply. You can pretty much gather that the sensitivity in mV/g is the power supply voltage divided by 10. More or less. Another ratiometric value is the “0g bias”. I don’t do a whole lot of analog electronics stuff, so this took me a bit to figure out. The accelerometer chip can detect negative acceleration, but it doesn’t output a negative voltage signal. What you do is consider the middle point of the power supply voltage range the 0 point. My power supply voltage is 3.3V, so I have to treat 1.6V as the zero point. You’ll add have to subtract that zero point from any voltage reading to get the actual mV/g value. Here’s some numbers to drive the point home. My power supply is 3.3V, which is 3300 mV. 3300 divided by 10 is 330, so the chip is going to deliver 330 mV per 1g of acceleration. If I have the module on my table with the z-axis point up, it’s going to have 1g of acceleration applied to it, since it’s going to just read the pull of the Earth’s gravity and no other force. The chip’s zero point is the middle of the power supply range, 1.6V (1600 mV), so the actual voltage value it’s going to output for 1g of acceleration is 1930 mV, or 1.93 Volts. Since I know all this, I only need to subtract the zero point voltage to get the true value of 330 mV. If I turn my accelerometer upside-down, it’s going to feel -1g of force. The voltage it would output would be 1.27V. When you subtract the zero point voltage you get -330 mV, which comes out to -1g. Anyways, here’s the Arduino code that gets values for the X, Y, and Z axis spit out in units of g.
It’s a bit verbose, but I wanted to be super clear about what is going on. I dumped 20 seconds of gathered data into a .txt file and used Excel to make this pretty graph. For the first few seconds it’s just sitting on the table, so the z-axis is at 1g, and the x and y-axis are at about 0 (these aren’t calibrated readings, but it’s good enough). You can see when I pick it up and shake it around a bit, then put it back on the table. Neat. The motivation for writing this post is because it took me about an hour to reconcile the info in the data sheet with the values I was reading on the analog inputs. It was hard to find anything useful online that stated plainly what you need to do on the Arduino end. Hopefully this helps someone out. Post a comment or message me on Twitter (@cheydrick) if you have any questions. wonderful ! can i use the output values to determine the speed of an object ? Yes, the data came from the serial print lines in the listed code. I printed out “/t” in between the readings, which inserts a tab. Excel knows how to import tab delimited text and can automatically put the readings into columns. I could have also used a comma to delimit the data. Glad you liked the article; let me know if you have any other questions. Thanks again for your fast reply, I am a high school student new to Arduino so excuse the simple questions …when you say you “dumped” the data into a txt file did you do this separately or did you use a plx-daq, program and if so where in the code would I put instructions? Is there any order to which I open first Excel or my arduino board/code. It is a nice graph have you tried different baud rates or delay settings to smooth things out? Do you think it would make any difference in sentivities. Thanks again for the post and response! Sure thing. I can’t remember how I got the data into a text file in this particular project, but it would have been one of two ways. I either copied the output from the serial monitor that’s part of the Arduino IDE, or I wrote a Python program to connect to the Arduino and save the data to a text file. All of my Arduino stuff is sitting on a shelf at work – I’ll dig it up on Monday and replicate the results so I can be more specific. Increasing the baud rate or the delay won’t affect the sensitivity (more on that later), but it would affect the max vibration frequency I could detect. The delay of 100 milliseconds means I’m sampling at 10 times a second, or 10 Hz. There’s a rule (called the Nyquist frequency) that says you have to sample data at least twice as fast as the frequency of interest. So at a 10 Hz sampling rate, I can only (barely) capture a 5 Hz vibration safely. Any other higher frequencies will be garbled (or aliased). The sensitivity of the accelerometer is a product of the power supply voltage, and the bit depth of the A/D converter. If I needed more sensitivity I think I’d start with using an A/D converter with 16 bits of resolution. The Arduino only has 10 bits, which is pretty good for most purposes. I think I did just copy/paste from the serial monitor into Excel. I just tried it and it worked. The fancier way would be to write a receiver program on the PC to read what the Arduino is outputting over the serial line. That’s not so hard to do in Python. It depends on what you’re trying to do. I use Arduino boards at work, but instead of reading serial data from them, I send serial data to them. They read the serial data and parse out the commands and to various things, like turn power on/off to some devices and send control signals to others. I’m still confused about the power going to accelerometer, how do you determine the value is 3230mV? and what the function midpoint? I used a multi-meter to read the actual voltage powering the accelerometer. The midpoint between 0 mV and 3230 mV is the voltage that is output by the accelerometer when the acceleration is 0 G. Knowing this is required to calculate the actual G value. No, sorry. I’ve never used any wireless protocol or board. Hey, Thank you for this project. I am planning to use same sensor for my project. I want to know that, is this code helpful for acceleration measurement of falling object ? I also want to know that can I detect that, at what acceleration falling object hit the ground? Sure. The code samples just print out what acceleration is measured by the sensor. If I want to use ADXL335 to judge object movement status like walking or stationary, how to achieve this? Could you give me some advice? Hey sir …did this cod give me the final results of accelerations in x,y,z .? and this is meaning I don’t have to make calibration process ?. did your excel result show for z +axis up direction ? hi this is really useful thanks… question though, how about 4 accelerometers simultaneously? is that doable? and what about sample rate? I’m looking for a project that would focus on one sudden impact so would want the sample rate as high as possible, sorry if i sound dumb, but this isn’t my thing, asking for daughter. The accelerometer I used for this post sends data to the analog inputs on the Arduino board. Each accelerometer has three analog outputs (x/y/z) so four accelerometers would need twelve inputs on the Arduino. The Arduino Uno I used only has six analog inputs, so that model wouldn’t work. Other Arduino models have more analog inputs. If I was in a time crunch and only had the model of Arduino and accelerometer I had on hand for this post, I’d solve the problem with two Arduinos, each with two accelerometers attached. The only way I know how is through the NumPy FFT function. The links below are how I figured it out. how do i change x, y, z axis into a graph as it is showed in the above article, and also please tell me if that graph appends automatically? If I recall (this was over three years ago) I copy/pasted the data from the Arduino Serial Monitor into a .txt file, then imported the .txt file into Excel. Not automatic at all. Do you think it would be possible to sample the mV input to the accelerometer using another analog pin and assign that value to the mVperg variable? I might kind of act as a reference voltage. That might improve accuracy a bit? I haven’t measured the output voltage stability of an arduino supply, so I am just kind of guessing. 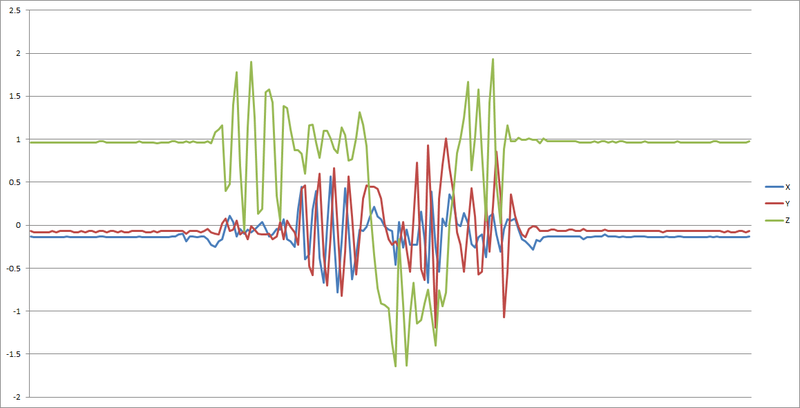 Not sure, but it may account for variations in the input voltage to the accelerometer as loads change on the Arduino.